The Domesday Book tells us that there were three mills in Cheltenham at that time and two more were added. It is believed that these were - Sandford Mill, Barrets Mill, Upper Alstone and Lower Alstone Mills and Arle Mill. By the late 19th C however, mills were becoming obsolete as grist mills, though some continued using the water power for other purposes. Indeed, Bedlam Mill at Arle became a fulling mill, whilst Upper Alstone Mill became a saw mill in the early 20th C. These small mills could no longer cope with the quantities of flour needed for the expanding population of Cheltenham. Upper Alstone Mill had an overshot wheel, and stood on rising round at the junction of Millbrook Street with Great Western Road. The mill is unlikely to have been the original Domesday Mill, though would be on the same site and, like most mills, had a succession of millers. An early map of the 18th C shows it to have been Mr. Gregory's Mill and in 1844 one Michael Bricknell was miller there. He was followed by Thomas Perry who ran an expanding business which gained from the increasing population and the proximity of the GWR. 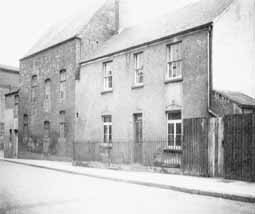 By 1870, however, the mill was occupied by Elijah Snowsell who combined the milling business with running a bakery in the High Street. Often a milling family would operate two or even three mills and run the bakery side of the business. Later, Upper Mill was taken over by William Ride and Co., Corn and Flour Merchants of Tewkesbury. It was Ride who introduced steam power to supplement the reduced water power. By the 1920's, however, it ceased to operate and the buildings deteriorated rapidly. Upper Alstone Mill was demolished soon after WWII, leaving only the weir and this too, has been subject to a great transformation with the development of the Waitrose Site. Lower Alstone Mill, however, still exists though bearing little resemblance to the original mill, The surviving mill house is believed to date back to c 1840 and unlike the Upper Mill, was powered by an undershot wheel. A dam was constructed nearby to periodically release water to power the wheel, when river flow was insufficient. Like the Upper Mill, it too had a succession of millers and when Mr. Gregory operated Upper Mill, the Neale family worked the Lower Mill, father and son, carrying on the business. In 1841 the tenant was John Davis, miller and baker, employing three men and prior to 1858, one Frederick Boulter continued as Miller, no doubt getting some of the grain from Six Chimneys Farm which stood next to it. Frederick Boulter was superseded by George E Gardner who paid a rent of �25 p.a. But in 1898 the mill was auctioned and then described as a three-storey grist mill with three pairs of stones and a bolter, with 12 hp. boiler, so evidently it, too had turned to steam power. Interest in milling having declined it was sold for only �675 and this included adjacent property and some opposite, next to Lower Alstone House. 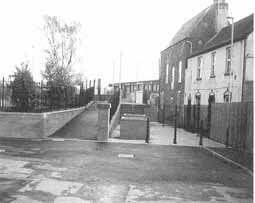 But by the 1920's the Mill no longer functioned - the pond was filled in and now is part of Gloucester Road Junior School. The Mill House was gutted; doorways were blocked up and it became a Social Club for the employees of the nearby Gas Works, in the 1950's. In recent years, however, the work of the Environmental Agency on the River Chelt which once powered the mills, meant that structural support was needed as work was carried out in the vicinity. The final result is a much restored mill house, an impressive flight of steps, giving access to both Arle Avenue and Lower Mill Street, which access was the subject of a dispute in the 18th C.
The life of a miller could be short or long-term. The most common hazard was lung trouble brought about by long years of labour in a dust and flour-laden atmosphere and 'Miller's Throat' was a common complaint. But another, much more dangerous hazard could occur through carelessness if the miller's clothes got caught in the cogs and he was drawn into the machinery. Yet another dangerous practice, sometimes indulged in by the apprentices, was that of hanging on to the sack hoist as it was raised to the upper floor, which prank often led to broken limbs. No Health and Safety rules in those days. 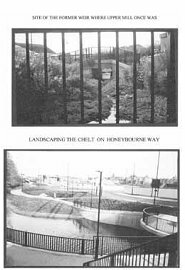 But we should be thankful that at least this piece of history in our Alstone area still survives and that the Environmental Agency, during its improvement to the Chelt, has done a great deal to restore it, by the erection of a smart footbridge giving access to both Collets Drive and the road leading to Gloucester Road, through traffic having been banned for several years. Despite the vast changes in this area, if you study the old maps, you will see, that basically, the roads remain in much the same spot as they did hundreds of years ago and despite the demise of the Gas Works and the coming of Tesco, the development of the nearby industrial estate; the two ancient buildings, namely Lower Alstone House and the Mill have survived.